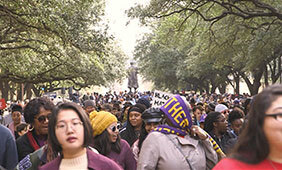 The annual MLK march, held at UT Austin campus. Photo by Raul Buitrago. WHAT: The Black Studies @ 50: 1968/1969 conference, hosted at The University of Texas at Austin, calls on scholars, artists and communities to continue the legacy of 1960s activists who helped institute black studies across American university campuses. Featured guests are author Edwidge Danticat and cinematographer Bradford Young. WHEN: March 14-15. View the full event schedule at blackstudiesutconference.org. WHERE: AT&T Executive Education and Conference Center, 1900 University Ave., Austin, TX. WHO MAY ATTEND: To attend, register at the conference's website. The event is free and open to the public. BACKGROUND: The conference, organized around the theme “Black Studies @ 50: 1968/1969,” will explore the legacy from the late 1960s, when students challenged colleges and universities to diversify their curricula and communities, to the present day, as scholars continue to study the experiences of people of African descent and use that knowledge to engage with and better their communities. “This is an opportunity for us to invite scholars and artists to discuss the diversity of the experiences of people of African descent around the world, but also to share the vision of black studies at UT with as wide of an audience as possible,” said the conference’s chair, Jennifer Wilks, associate professor of English and African and African diaspora studies and associate director of the John L. Warfield Center for African and African American Studies. While on campus, conference guests will explore the growth of black studies at UT Austin since the founding of the Afro-American Studies and Research Center in 1969. From self-guided tours in the Christian-Green Gallery and IDEA Lab art exhibitions to research presentations and panel discussions on cultural, political and educational topics, conference attendees will explore issues of social justice and the transformation of black studies during the next 50 years. 6:30 p.m., March 14: Edwidge Danticat, a two-time National Book Award finalist for her works “Krik? Krak!” and “Brother, I’m Dying.” A book-signing will follow the keynote. Noon, March 15: Bradford Young, best known for his work on “Selma,” “A Most Violent Year” and “Arrival,” and the first African American cinematographer to be nominated for an Academy Award. The conference will be hosted by the Warfield Center, the Department of African and African Diaspora Studies, the Institute for Urban Policy Research and Analysis and the Art Galleries at Black Studies — four units that compose black studies in the College of Liberal Arts at UT Austin. NOTE TO EDITORS: Members of the media who are interested in attending should register for the conference at blackstudiesutconference.org. Press packages and badges will be available for pickup at check-in. To receive credentials, email rachelgriess@austin.utexas.edu by March 8.